What India really needs to do at Johannesburg? Above all, India must push for the creation of a BRICS currency stabilization fund which has been spoken about in the past but was never implemented. The Chinese premier Xi Jinping, in his speech on the first day of the 10th BRICS Summit on Wednesday, focused extensively on the futility of a global trade war. Jinping surely had a point and a strong interest in standing up to the US-imposed tariffs. US President Donald Trump has already imposed tariffs on Chinese imports to the tune of $34bn and plans to expand it to $200bn by September this year. If Trump has his way, then the entire import quantum of $500bn may come under tariff threat. The US has a clear game plan here. They realize that costlier Chinese imports may hurt farmers in the US. But, the US still has the world’s largest domestic market, whereas China’s manufacturing and domestic earnings power are largely predicated on global demand for its products. At some level, perhaps, Trump realizes that he can afford the trade war much longer than Xi Jinping can. But where does India fit in this situation and what can it do about it? India has a slightly delicate position to handle when it comes to trade. It needs to remember that, unlike other BRICS’ members, it is still a net importer. With a likely trade deficit of $200bn for the fiscal year 2018-19, India will possibly be a lot more neutral about the ensuing trade war. What India needs to stand up to is American unilateralism, but the risk is that it may be replaced by Chinese unilateralism, which is not exactly in India’s interests. Moreover, India needs to worry a lot more about the currency effects of the trade war rather than the trade war per se. The India rupee is already vulnerable to global shocks and the last thing that India would want is a currency war. In fact, India must push for the creation of a BRICS currency stabilization fund which has been spoken about in the past but was never implemented. Apart from India, Brazil, South Africa, and Russia have already seen a run on their currencies and would be more than willing to implement this safeguard. If Xi Jinping’s speech at the 10th BRICS summit was any indication, his top priority appears to be raising the pitch against the US trade wars. Obviously, that is where China’s interest is. However, this is a perfectly apt time for PM Narendra Modi to play the tough diplomat. India must definitely support the vote against unilateralism, but it must come “with strings attached”. This, needless to say, would be to make it clear to China that it cannot expect Indian cooperation against the US while Chinese soldiers simultaneously try to make advances at Doklam. Furthermore, India’s support also cannot be compatible with China’s unbridled support to Pakistan and its constant blocking of India’s admission as a Permanent Member of the UN Security Council. India needs to make clear this with China at the BRICS Summit. That is one area where China has probably surged ahead and India needs a lot of catching up to do. While India committed around $200mn to Rwanda, China has already committed close to $15bn to Africa, literally coming to the continent with a blank checkbook. India already has a history of long business relationships with African countries and that has to now translate into something greater now. India needs to start using its heft by committing bigger amounts to investments in these countries. It may not be able to match China dollar for dollar, but larger commitments with time-bound deliveries will go a long way in expanding India’s influence in the African region. After all, it is the one large market that is still largely untapped. For over 400 years since the Renaissance, the center of world power has been concentrated in the West. First, it was continental Europe, then the UK, and now it is the US. BRICS can effectively emerge as an alternative to the concentration of economic powers in the West. Some of the biggest global organizations like the International Monetary Fund (IMF), World Bank, United Nations (UN), and the North Atlantic Treaty (NATO) are all Western ideas. 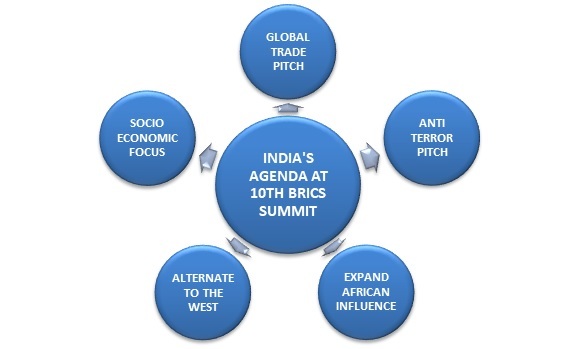 The first way to expand the influence of the BRICS is to expand the BRICS membership. There are developing countries like Mexico, Turkey, and Indonesia that are already $1tn economies and are still growing at a rapid pace. They can be the key to the expansion of the BRICS group. Then there are the likes of Nigeria, Kenya, and Egypt within Africa that are growing much bigger at a rapid pace. All such nations need to be included. If India needs to be really credible in the African region, it needs to demonstrate real and tangible growth in its socio-economic parameters. But this is exactly where India takes a hit. India’s per capita GDP is about $2,150 which makes it almost 1/5th as rich as Brazil, China, and Russia in terms of individual purchasing power. Even on parameters like primary health and primary education, India lags most east European and Asian nations. For example, India’s rate of infant mortality is 37 per 1,000 live per births compared to a mere six for Russia. India spends 1.2% of its GDP on health, while China spends around 6%. One of the big takeaways for India is that they will have to demonstrate a clear timetable in these areas to garner more credibility in the African region.